Lawyers of Guantanamo prison detainees have been notified by a US official that the men who can neither be prosecuted nor released will have cases reviewed to decide on their indefinite detention. It comes days before a Senate committee hearing on Gitmo. The notification published by Leopold on the The Freedom of the Press Foundation website comes some two years after the US President Barack Obama signed an executive order to form a parole board to begin reviewing the prisoners’ cases. The White House administration has claimed that the prisoners can neither be prosecuted nor released either because the evidence against them was obtained through torture, or because they are still too dangerous to release. This is despite the fact that 86 of the 166 prisoners at Guantanamo have already been cleared for release. Now, after more than a decade of detention for some of the detainees, they will finally have their cases reviewed to determine whether they should still be indefinitely detained. The periodic review board would be “composed of senior level officials from various U.S. government agencies,” according to Joerg. It will not address whether the Gitmo prisoners’ “law of war” detention is legal, but will rather determine the level of “threat” for each individual, and decide if their detention needs to continue. “Detainees receiving hearings will be notified by a Personal Representative assigned to assist them in the process,” Joerg wrote. The announcement coincides with a Senate Judiciary subcommittee hearing on Guantanamo, which is scheduled to take place Wednesday. The hearing titled “Closing Guantanamo: The National Security, Fiscal, and Human Rights Implications” will be the first significant hearing on the US offshore prison since 2009, Leopold notes. 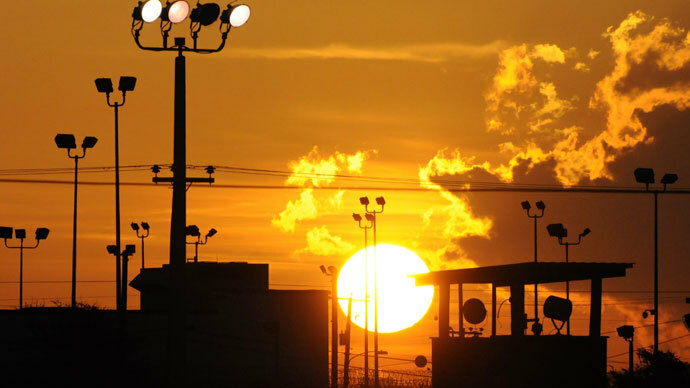 The latest developments come amid the unceasing hunger strike by Guantanamo prison detainees, in which 75 detainees are currently designated as hunger strikers, with more than a half of them subject to a painful force-feeding procedure twice a day. The number of hunger strikers is said to have decreased since the start of the Muslim holy month of Ramadan after the prisoners have been given the opportunity to return to communal living and pray together during the month-long fast. While commending the move “giving these men a second look,” some attorneys for Guantanamo detainees remained skeptical of the US government’s motivation. “What’s surreal about this is that nobody is going to have new information about what happened 11 or 12 years ago,” human rights attorney David Remes told Leopold. Remes represents more than a dozen Gitmo detainees. 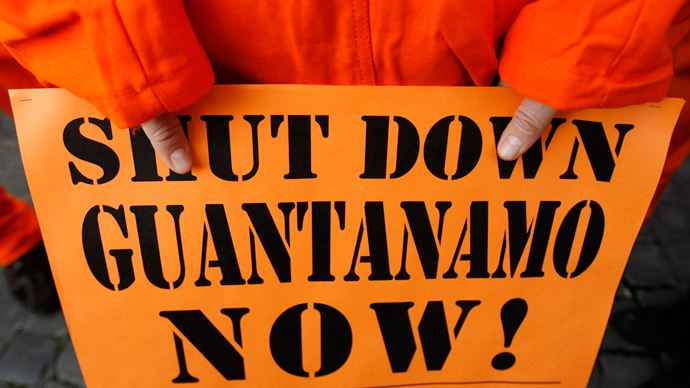 President Obama promised to close Guantanamo as part of his election campaign in 2008 and recently, Obama suggested “redoubling efforts to close the prison at Guantanamo” in his Berlin June 19 speech. However, no concrete steps have yet been taken to facilitate the transfer of those Guantanamo detainees who have already been cleared for release, and no steps been taken to solve the cases of the others. 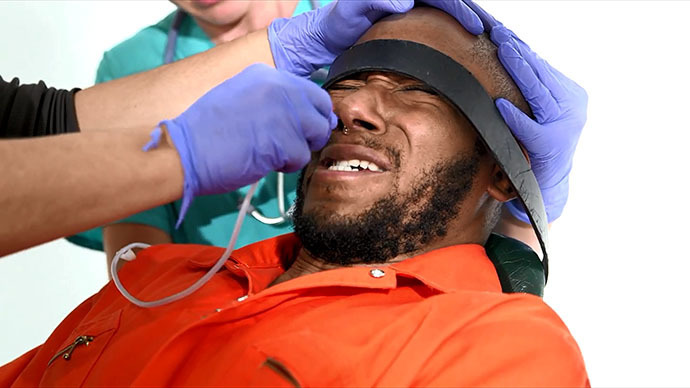 Meanwhile, international human rights organizations have documented numerous abuses of Gitmo prisoners including sensory deprivation, prolonged isolation, 20-hour interrogations, stripping and forcible shaving. Most notably, the practice of force-feeding has been branded a “gross abuse of human rights” by Amnesty International. 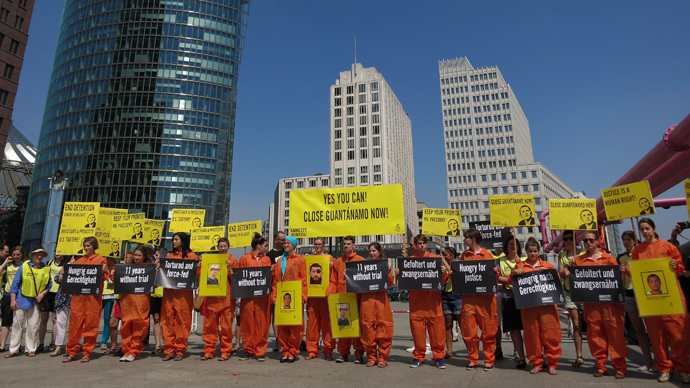 The group has also been calling on the US government to give the detainees at Guantanamo fair trials in US federal courts and charge them or release them immediately. On June 19, over 150 doctors and medical professionals signed an open letter to President Obama calling for the hunger strikers to receive independent medical care. Terry Kupers, a psychiatrist and consultant for Human Rights Watch, has warned that if the hunger strike continues, the damage to those starving themselves will be irreparable.